ABI am Amy Forsyth, a certified personal trainer and fitness nutrition coach. I specialize in helping men and women achieve their individual health and fitness goals by creating effective and efficient programs tailored to each individual’s current fitness level and lifestyle. I was not always so health conscious. After college I found myself far too caught up in the demands of my full time job and social schedule to care about such things as exercise and nutrition. I don’t know exactly how much I weighed at my heaviest point; I eventually stopped getting on the scale. I was extremely unhappy with the way I looked and how tired and sluggish I felt all the time. 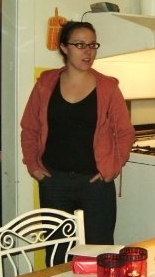 This was me in 2007. I started making small changes in my diet and behavior. I started seriously training instead of inconsistently doing moderate aerobics. I eventually went from a size 12 to a 2 and decided I wanted to help other people who wanted to improve their health and fitness but weren’t sure how to do it on their own. I understand that making the commitment to live a healthier life is not always easy or convenient, but the rewards are well worth it. Love the website. Tell Gene I said hello. Thanks Caleb! I’ll be sure to let Gene know you stopped by.